There are some weed species that every forage producer should know. Dodder is one of them. This unique, parasitic plant has no leaves or chlorophyll. Rather, it prefers to derive energy from other plants. 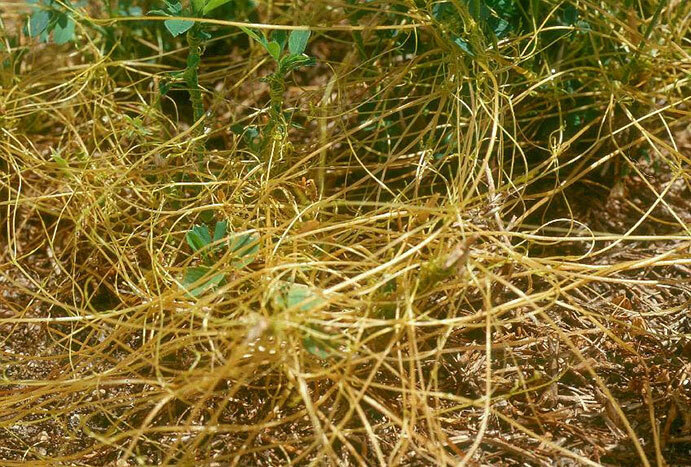 “Dodder lives by attaching to a host with small appendages known as haustoria; it then extracts carbohydrates from that host,” says Mark Loux, Ohio State University Extension weed specialist. Sometimes that host plant can be a legume forage species. Loux recently reported that dodder was being found in some Ohio red clover fields. In fact, the species is adaptable and found in many regions of the United States, but it is more ruthless in some areas than others. Dodder is an annual that spreads by seeds. The keys to control are to catch it early and not let the plants reach reproductive stages. Its seeds can survive in the soil for over 20 years. Forming a mass of yellow-orange, string-like stems, dodder is smothering in growth habit. According to the OSU weed scientist, pre-emergence applications of some herbicides have historically provided the best control once it is known that dodder is present in the field. Kerb has been used successfully in ornamentals and turf as a pretreatment. Trifluralin (Treflan) and pendimethalin (Prowl H2O) are good pre-emergence options but may not provide season-long control, says Loux. For Roundup Ready alfalfa, glyphosate can be used as an effective post-emergence treatment. Glyphosate can also be used as spot treatment in any field where dodder infestations are limited to smaller areas and killing the dodder becomes a higher priority than saving the desired species. Loux also notes that Raptor (5 ounces per acre) and Pursuit can suppress emerged dodder, but plants must be less than 3 inches tall. For Pursuit, applications need to be made before the dodder attaches to the host plant, and it needs to be applied with crop oil or methylated seed oil. A severe infestation of dodder caused by a lack of early control can be challenging. Early identification and action will make for an easier road to dodder eradication.